Northern School Supply was located in a 4-story 77,000 sq. ft., loft style, post and beam warehouse building in downtown Fargo. The building was constructed on land leased from the BNSF railroad. The land lease was about to expire, the neglected building was scheduled for demolition, and we didn’t know if we would get our signs off the building in time, let alone close the sale of the building. A casual discussion with Dr. Tom Riley, then the Dean of the Humanities department, and Dr. Paul Glye, Dean of the Architecture department at North Dakota State University, started a chain of events that resulted in NDSU establishing the School of Architecture as the first NDSU department to be located downtown. Northern School Supply was located in a 4-story 77,000 sq. 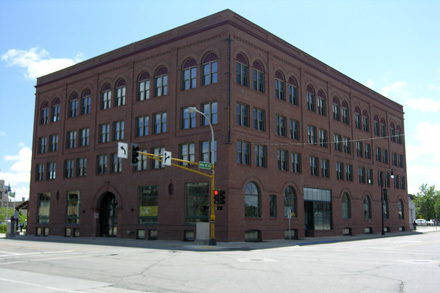 ft., loft style, post and beam warehouse building in downtown Fargo. The building was constructed on land leased from the BNSF railroad.